The Los Angeles Clippers franchise has made major business decisions that costed them a hefty fee during the offseason. 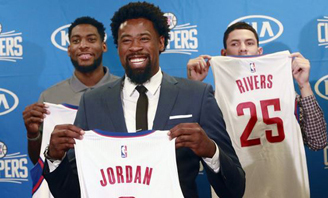 The return of DeAndre Jordan came with its own consequences, costing the Clippers a $250,000 fine for violating NBA rules, according to Black Enterprise. Despite the financial set back, Clippers owner Steve Ballmer recently turned down a $60 million deal with Fox Sports Regional Sports Network Prime Ticket Channel. The former Microsoft CEO wants to create an All-Clippers streaming service, according to Yahoo Sports. On July 2, the franchise made a contract presentation to Jordan, which included a Lexus endorsement that would pay him $200,000 per year. The presentation happened before Jordan announced that he would sign with the Dallas Mavericks, according to NBC Sports. At the end of the 2015-2016 season, the local broadcasting rights contract that Prime Ticket has with the Clippers will expire. Prime Ticket currently pays the Clippers $25 million annually to broadcast games and offered to pay a 140 percent increase, according to the Washington Post. However, Ballmer plans to capitalize off the trend of consumers moving from traditional cable deals to programs like Hulu and Netflix, according to Yahoo Sports. If Ballmer creates a streaming station for the Clippers, he would have to fund the cost of infrastructure, programming, and promoting, Yahoo Sports reports. Despite the franchise’s postseason performances in recent seasons, Lob City also lacks popularity among Angelinos. The franchise had a 1.10 rating on Prime Ticket in mid-February 2015, according to the Los Angeles Times.